The Camel riders are busy working on the upcoming Apache Camel 2.18 release. As we update the release notes on the fly, its a way of quickly looking at what is coming. I just wanted to do a quick update here in the summer what we have done so far with the highlights in short form. More elaborate details to come when a release is getting closer and the documentation improves. Apache Camel 2.18 is the first release that is requiring Java 8 as the runtime. I have previously blogged about that. So all the build and source code has been changed to compile as Java 8, and we have started using Java 8 code style with lambdas in new code (not in existing code as we backport fixes to older versions). 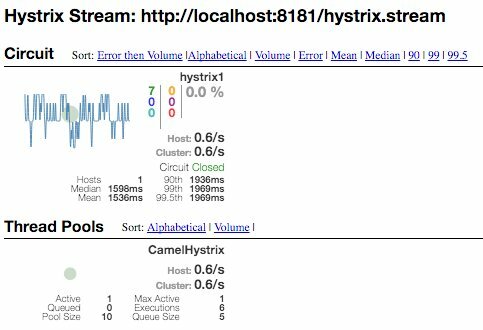 We have new components that integrate Camel with the Netflixx OSS stack such as Hysterix and Ribbon. which is integrated with the Hystrix dashboard. And there is also a Zipkin component for distributed message tracing. We have introduced a service call EIP to abstract and making calling external services from Camel easy. The idea is that you can call a remote services the same way regardless where the service is hosted. 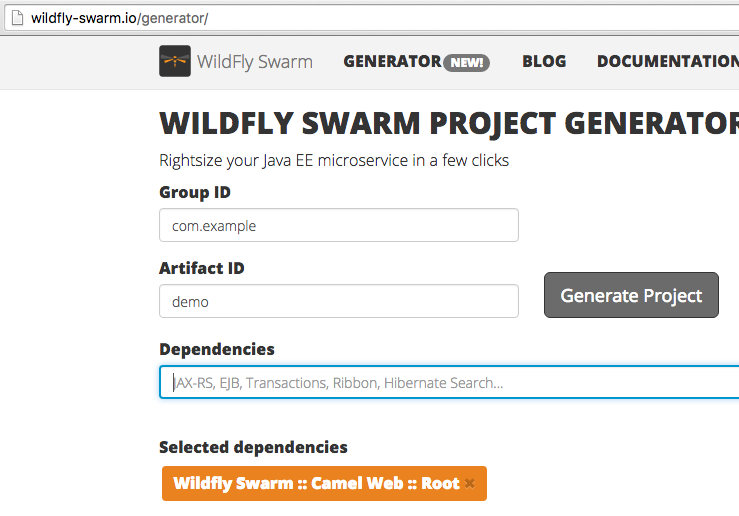 Camel will lookup the service from a service registry of choice, such as from kubernetes, openshift, cloud foundry, zuul, consul, zookeeper or whatever. Running Camel on Spring Boot has been improved. Camel is now available in the Spring starter website. .. and Camel is now also on the WildFly Swarm website as well. All Camel components and data formats now provide auto configuration options (with documentation) you can configure from tooling (we are pondering how to do similar for endpoint options). And its all auto generated from the source code, so when a new option is added its automatic included in the next release. We are in the process of migrating the Camel documentation from wiki to ascii docs files that are included in the source code, so we can generate a new website and documentation. 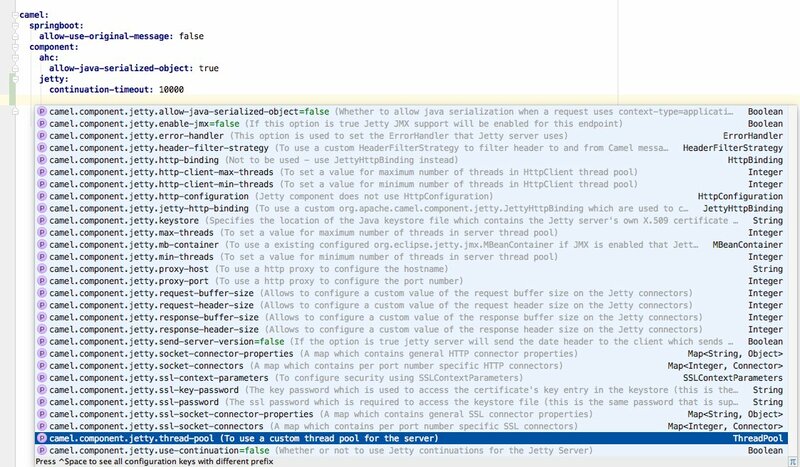 This also allows us to keep the documentation automatic up to date from the source code. Huge thanks to Andrea Cosentino who has patiently done most of the migration, which is a labor intensive process. And as usual there is a number of new components. Currently we have 8 new for you. Apache Camel 2.18 is targeted to be released after the summer vacation, around September timeframe.